When you first purchase a home, there are bound to be several features that you consider eyesores. What many people don’t know is that these challenges have a simple solution! Perhaps you have a room that’s very narrow, extremely long, or extremely small? 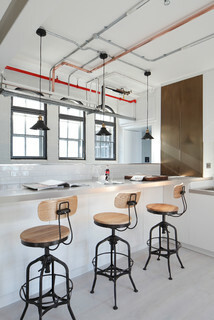 In Stock Kitchens have some tips and tricks to get you through your kitchen designing dilemmas! Stripes! 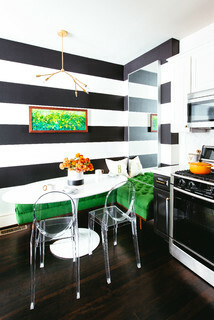 Stripes are able to visually expand a room. It does not matter if the stripes are narrow or wide, however, make sure they run horizontally! The reason is because you want eyes to travel left and right. You can paint stripes on or simply use wallpaper, but it is the best way to make a room appear wider! White on White on White! 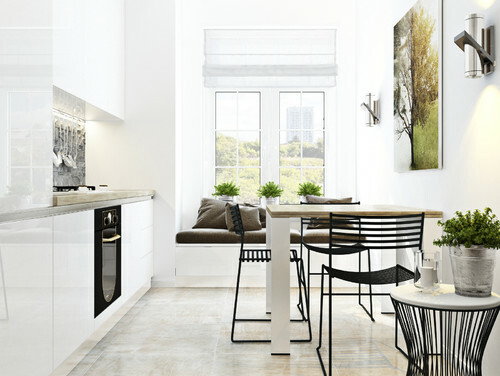 An all-white or soft-toned color, you can easily lead eyes to the window of an outdoor space. These helps alleviate a cramped feeling in what otherwise is a narrow space. The important part here is to minimize textures or patterns which can distract eyes from going outside. Color. Pick a bold color that you love. By adding this to a smaller room, you can create a snug vibe that people enjoy being in. In our example here we have a very luxurious feel, even though it’s pocket-sized! Mirrors. You can easily create the illusion of a much larger room by adding mirrors. You can trick people into thinking the size of a room is twice as big by adding floor-to-ceiling mirrors. Divide and Conquer. Creating zones or areas in an open space can boost functionality and also provide a great deal of privacy. With free-standing dividers or sliding walls, there are many options to design attractive features that also are not necessarily permanent. Inception. Try designing a room, within a room, within a room (get it!?). All jokes aside, by adding screens or glass doors within rooms, you can provide a high level of privacy that is also seemingly not there. You can even throw some curtains up from the ceiling so a specific area of the room can be boxed off. Celebrate differences. Typically when you hear about or see exposed pipes and brick, you think of an industrial building, factories, warehouses, etc. Why can’t we embrace this feature in a home, or dare I say, highlight it! Try painting the pipes in different, fun colors. Purposely draw attention to them and highlight the cool designs that are naturally made by them. More plumbing! 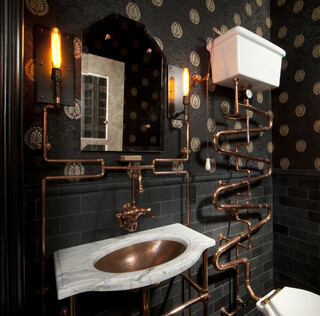 Have the exposed pipes featured throughout the room or even throughout the house, maybe as a theme. Try to match the original pipe styles, even if they aren’t functional. Polish them, shine them, embrace them! That’ll certainly provide a real WOW factor. Natural beauty. The view out of a window could make or a break the purchase of a new home. No one wants to see an old rundown building or other unsightly views right next door. Do you garden? If not, you should start! Planting pretty trees is an excellent way to hide any unpleasantries, and also greatly enhance your property. 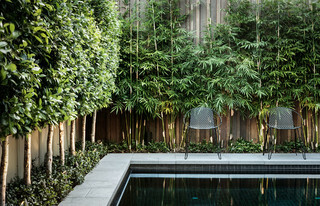 Try to stick with evergreen trees such as bamboo. However, the best solution would be to speak with a professional landscaper who can most properly guide you in the best options. Hide in plain sight. Blinds can easily block any ugly view you want and also create some privacy for you. You can install blinds that allow plenty of natural light in, while also restricting outside view. If you have the budget or extra money to spend on the kitchen costs, you can also look into some beautiful custom blinds! Tall curtains. The dreaded low ceiling! Although it sounds terrible, there is a very simple and cost effective solution! Try hanging curtains from the ceiling that reach the floor. Call it Houdini magic, but this can actually create a waterfall feel that gives the illusion of height. Furnishings. Transparent furniture definitely make a space feel much more open. 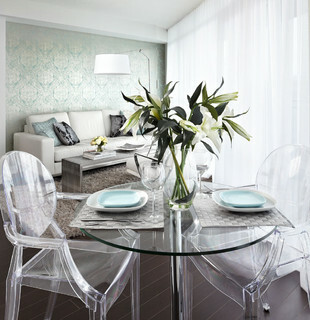 Go with glass or acrylic selections that also add some glamour! This style can also make a room feel a little loftier than it really is. Tight squeeze. You might either really need or desperately want a study room or office. However, you just don’t have the space for it, how tragic! Did you know you could transform the are beneath a stairwell in a perfectly usable room!? Go figure! Don’t be concerned with the awkward angles of the stairwell; use it to your advantage! Install some shelving to hold the essentials. Shelf Stacking. 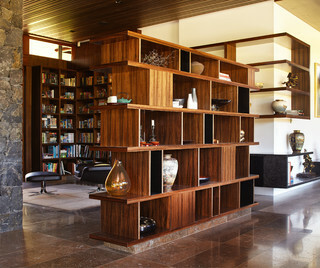 Instead of having guests stare at a blank walls, install some stacked shelves. This could be the case next to a fireplace or television set in the living room. You won’t regret it!